Texas Instruments Listen & Learn "Sounds we Hear"
New price: $21.21 (1992) Display size: n.a. 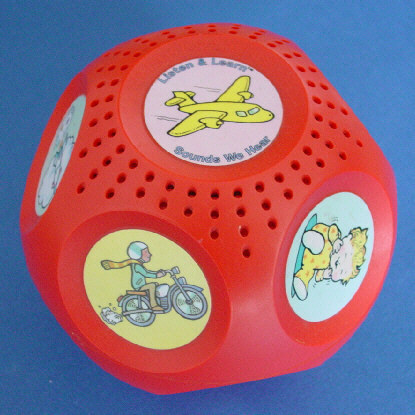 Size: 6.2" x 6.2" x 6.2"
Small toddlers use the Listen & Learn toy like a small ball. Due to the flats on each side the toy will find a stable position and plays a sound associated to the pictures on top of the ball. The Listen & Learn uses again Texas Instruments speech technology introduced with the Speak & Spell. The toy is intended for toddlers ages 6 to 36 month. Other toys for toddlers are the Peek-A-Boo Zoo and the Magic Sorter. The Listen & Learn "Sounds we Hear" is featured in the Texas Instruments Incorporated leaflet Follow the Learning Path™ dated 1991.